Meet Your Friendly Neighborhood (Well, Community-Based, Anyway) Spider-Man As you may have heard, there's a new Spidey in town, sort of. Peter Parker: Out. In: The equally alliterative Miles Morales. ... And when we say "community-based," we technically mean Community-based. As in the NBC sitcom. Starring, among others, Donald Glover. He lost out to a lanky, albeit endearingly sincere, Brit, but Glover's comic-book story didn't end there. Let's back up: We've discussed the Ultimate line of Marvel comics before — a wholly separate, alternate universe launched in 2000 with the goal of updating familiar Marvel characters "for the 21st century." The two universes exist side-by-side. In the mainstream Marvel Universe, Peter Parker is still the web-swingin'-est, listen-bud-he's-got-radioactive-blood-iest arachnid-themed hero going. But last month, in the Ultimate universe, Peter Parker died. Today, in the pages of Ultimate Comics Fallout #4, a new guy steps into the Spidey-suit. This kind of thing goes on rather a lot, in comics. But the reason you've already heard about it — the reason USA Today covered it, and the New York Times interviewed author Brian Michael Bendis — is because, even in this offshoot fictive universe, Spider-Man is Marvel's flagship character. And the guy taking over? 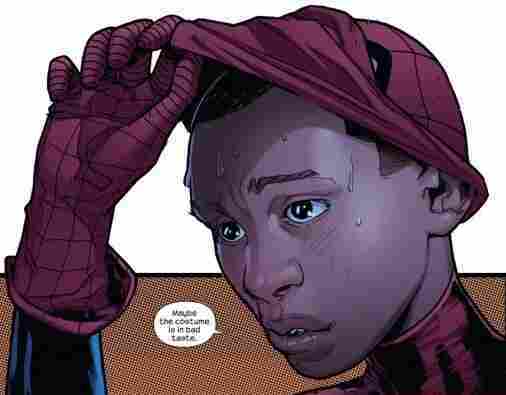 Is a kid of mixed African-American/ Latino descent named Miles Morales. "I'm a huge 'Community' fan," Mr. Bendis said, "and I went: 'Why couldn't [Glover] be Peter Parker? He'd be a great Peter Parker.' Then I realized I was working on that project already. And I realized we were doing the right thing." Mr. Bendis said he had also taken a lesson from a black friend who told him that Spider-Man was the only superhero that other children would let him play when he was growing up. "You couldn't see his skin color," Mr. Bendis said the friend told him. "He was any of us, when he was in costume." It's an outcome with no easily discernible downside: The spandex set gets a jolt of much-needed diversity, which subtly but perceptibly expands the storytelling canvas. Fans of Donald Glover get to see him — or at least a comics-page facsimile thereof — getting his "THWIP" on, in a way. And one vocal subset of comics fans — those who hanker for the comics they read when they were 12 years old, and who thus rail against anything that would alter a character's status quo — can nurse their imagined wounds by reminding themselves that their beloved, OG Peter Parker hasn't gone away. Such a simple question. But when it's asked seriously and thoughtfully, it can change a multiverse. Why shouldn't Spider-Man be black/Latino? Why couldn't The Atom be Asian-American? A lesbian in the Bat-family? Sure — why should the Bat-family be different than any other family, after all? Heimdall, Guardian of the Bifrost Bridge, played by the preternaturally hot Idris Elba? Well, Why on Midgard not? Samuel Jackson as Nick Fury? Laurence Fishburne as Perry White? Some folk in the comment thread of that USA Today article gamely attempted to mount an anti-Morales position, but those attempts — including, hilariously, the question "Why should white kids not have a comic book hero they can indentify with?" — need to be taken with a fleet of salt trucks. Because come on. Is is possible to overestimate the significance of this development? If it is, you can count on Marvel to do it: a Marvel press release, in classic Marvel fashion, would have us believe that "pop culture history" is being made today. Maybe, maybe not. It's much too early to say — though Bendis has promised Morales will stick around for a while. Haven't had enough Spider-talk? Then you might want to check out this post at the nifty superhero design website Project: Rooftop, in which I and several comics/costume-obsessed colleagues critique various Spider-Man costumes through the ages — including the redesigned Ultimate Spider-Man suit that Morales will be sporting in the months (...years?) to come.